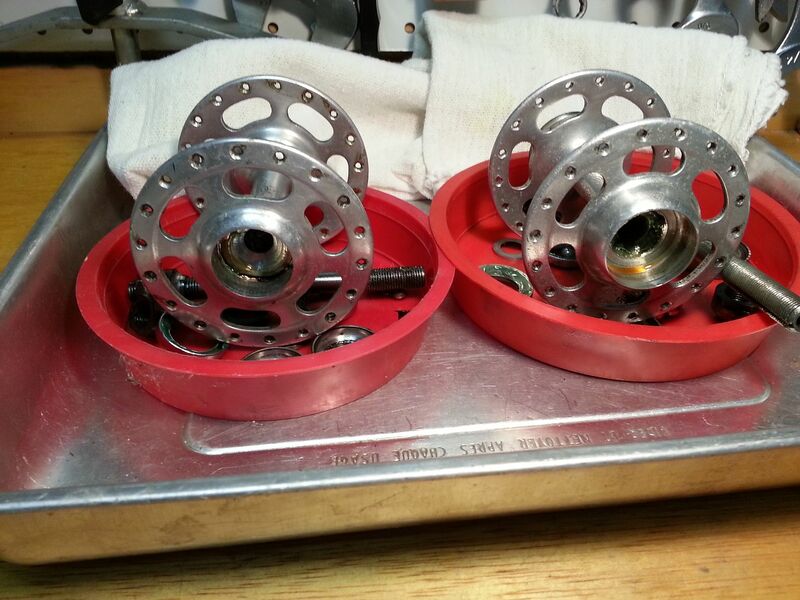 I'm looking to buy replacement cups for front highflange campy record. Anyone knows where I can find them beside buying donner hub? 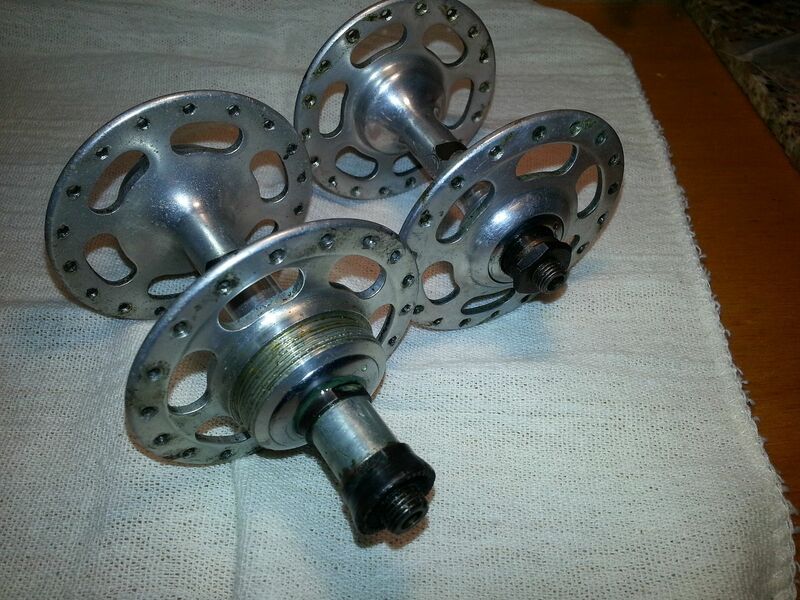 I don't want to buy a old donner hub and run into another bad cups again. 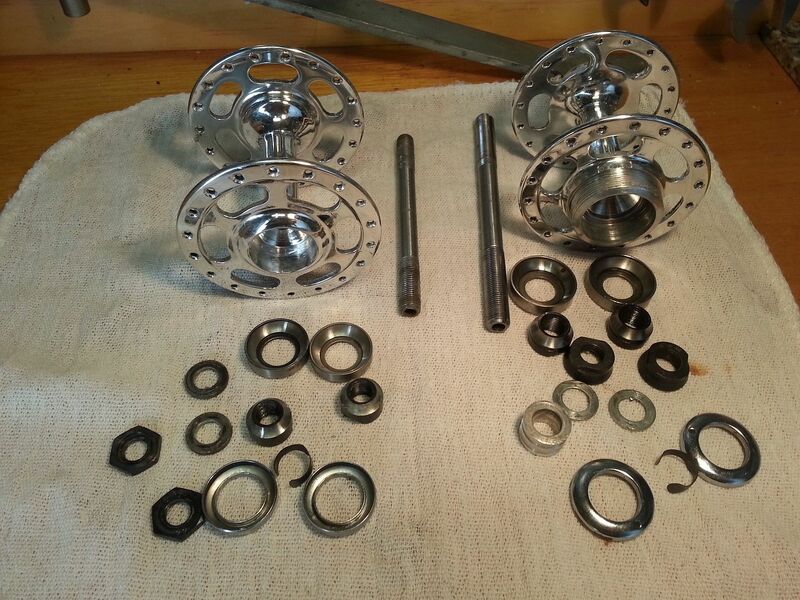 I know it hard to find and not easy to replace them but I already spend time polishing the hub, bought right length spoke, remove anodize and polish matching rims. All before I find out that the hub cups is badly damage. I might have a donor hub - will check to see if cups are any good. Thanks for your suggestions but I could not find anything. Donner hubs would be the only option. Anyone know if the size of campy cups were changing over time? Can I use any later hub such as veloce for donner? I hope you realize what you are in for in trying to change out the cups. Search the forum and you will find a thread that deals with the process. IIRC, the poster created a special tool just to get the cups out. They do occasionally show up on ebay. I've got a pair in the parts box but I can't honestly remember if they're front or rear. Or if there's a difference. Shoulda written that down, I guess. I really do not think so, Record cups were nicely ground, Nuovo Tipo for example were stamped. My bet Veloce would be too and probably not the same diameter and or width. 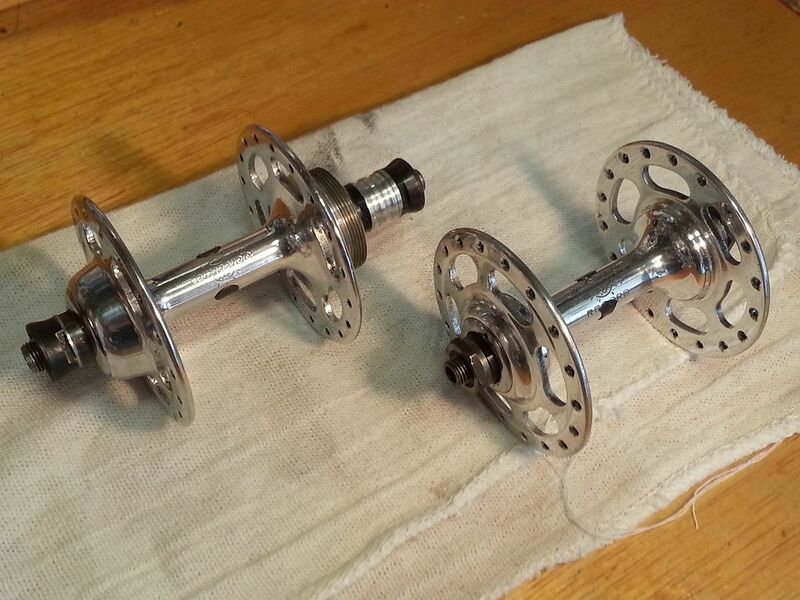 You might find that an alternate front hub even with your needing to polish it from the beginning will be easier to do effort wise and price wise too. The cups don't fail very often. Cones first, note they are smaller in diameter so the forces are more. I would look for replacement cups only if I had the hub already laced into a well built wheel. The effort to extract the old and press in new is not a minor effort, yes it can be done. You might find it a frustrating adventure. Part of the challenge is to pull or otherwise extract the existing cups with equal pressure all around, the tolerances are tight, and any unequal pressure will just lock it in, way back we had a customer who tried. We later called Art Stump, who had his special tool he devised for the job, very nicely made of three segments (think drill chuck like) with a rod that trapped the segments and allowed force to be applied. Here is one of the threads that shows MichaelAngelo's nice tool he made for the job. As well as a great cartridge puller T-Mar showed. Where are you located, Uyle? Boulder Bicycle has them but they are not cheap. Contact Mike Kone (I have an email address if you pm me). The Campagnolo front part number is 737, the rear part number 738. They are different sizes. I was quoted $48 for a 737 set plus $4 shipping. They occasionally show up on ebay for a little bit less. You may also need bearings and cones if the races are that bad. 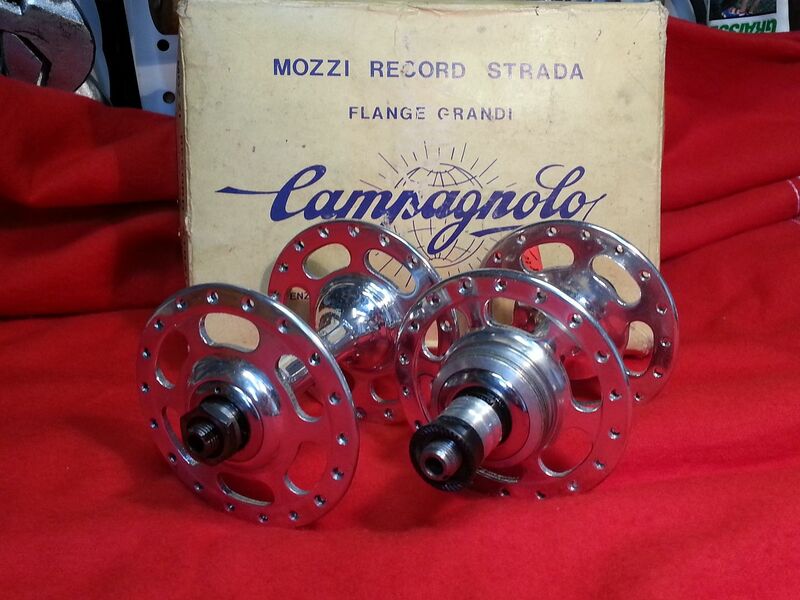 If you go to the Campyonly site you can down load old Campagnolo catalogs that will help you with numbers. Pulling them is a hassle. I built a tool similar to that posted above (but cruder). I had the right sized gear puller jaws already, however, that made things a lot simpler. If you look at Post 20 in the above link, T-Mar shows how to use these cheap cartridge bearing pullers Bike Tools Etc. - 1000's of bicycle tools and parts for the home mechanic! ; I have used them and they work very well; but the tool may not last through very many removals (depending how hard you have to pound on them), so you may want to buy a couple. 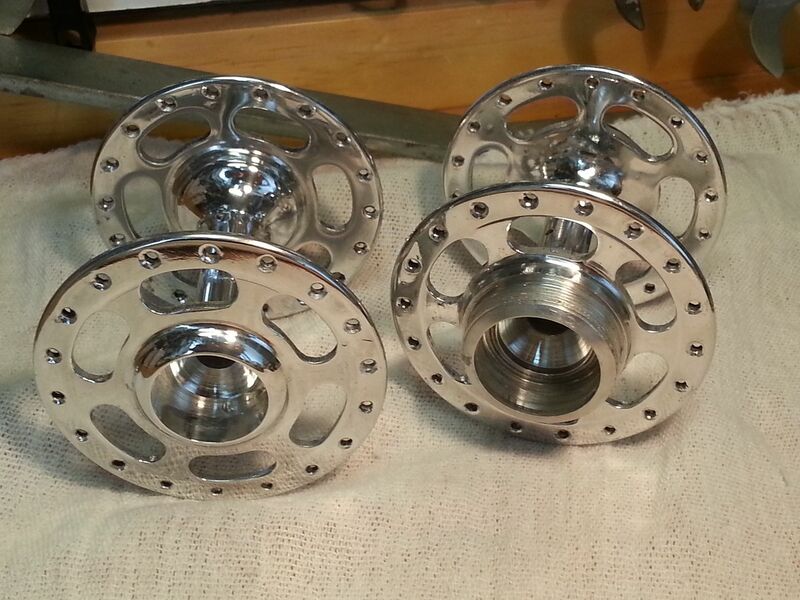 Unfortunately I only have a couple sets for the NR rear hubs, nothing for the front; the fronts are smaller in diameter. Also the Nuovo Tipo are not just inferior, they are a different size. Last edited by onespeedbiker; 01-09-15 at 12:31 AM. I have a tool that does not use heat, or hammers, and doesn't leave any marks on the hub at all. It will also work on built wheels too. Make sure you get nuovo record Races. T-Mar's tool will not be the one you want, it stresses the hub flanges, and leaves marks, also if happen to have a stubborn stuck race it will not come out, leaving you with a badly damaged hub. Whatever you do, DO NOT USE HEAT. Pray tell more, MA. Why not? If you please? There's no reason not to . All your doing is giving the shell a quick 2 second blast...just enough to slightly expand the aluminum. I can argue it's worse to go without heat because you increase the likelihood of getting a loss cup. I guess it's just me, I don't like heating aluminum with a torch. Also, it may affect the alloys strength . With the tool I made I have never lost a cup or damaged a hub not even the smallest scratch. I invented it using bushing puller basics. Thanks MA. That kind of makes sense. Aluminum has a relatively low melting point. Not that that much heat would need to be applied but, if it isn't necessary, why use it? Well I guess it's a matter of using reasonable force. I pulled several cups using the method; it was quick, easy and didn't leave any parks on the cups or hub (BTW I tested this on a donor hub before I used it on one I was rebuilding). Now if one has to do more than medium taps with a hammer, than they should look to another procedure. I also used a piece of PVC under the hub instead if wood, so there was minimum force against the flange. Last edited by onespeedbiker; 01-09-15 at 01:30 PM. I'm in Orange County, CA. Did you find the cups or donner shell? Thanks for the info. I will call them if I can not find a good donner shell.